Stacking it over center field at a baseball stadium didn't pan out. A few days ago, Chevrolet issued a press release that not only celebrating the start of baseball season and its hometown team, the Detroit Tigers, but also the new Silverado 1500 LT Trail Boss and Blazer RS. Examples of each vehicle were positioned atop center field at the Tiger’s home field of Comerica Park. The "Chevy Fountain” is a 10-year tradition that displays new vehicles at the park. However, USA Today is reporting that GM has quietly removed the Blazer RS and replaced it with a Traverse crossover. Turns out some UAW workers were offended by the Blazer because it’s built in Mexico. The Silverado and Traverse are both American-built. Currently, the UAW is fighting to keep as many factory jobs in the US as possible instead of sending them to Mexico where labor is typically cheaper. The UAW had fought but ultimately lost the battle to get the reborn Blazer built in America, so hoisting a new Blazer at an all-American baseball park was probably not the best idea. GM, however, had no bad intentions when it originally made the decision to display the Blazer. It simply sees the crossover as a new vehicle in a hot segment and displaying it at Comerica Park would have been excellent exposure. Many union members didn’t see it that way. GM defended its decision to display the Blazer before deciding it’d be best to swap it with the Traverse. 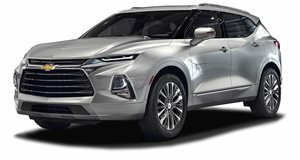 "American workers contribute more to the Chevy Blazer than anyone else,” said a GM spokesperson. "It pumps more than $500 billion into the U.S. manufacturing economy and supports thousands of U.S. jobs.” To make the situation even more delicate, the Detroit 3 automakers and the UAW are currently holding negotiations for a new contract. The current one expires this September. A Blazer parked on top of Comerica Park would have basically reminded many factory workers about sending jobs out of the country, recent plant closures, and a potentially uncertain future – all during a summer of bargaining. GM made the right call on this one.